Looking for the perfect place to escape the hustle and bustle of city life? Look no farther than the Sequim Bay Hideaway and it's sweeping views of Sequim Bay, Hurricane Ridge, John Wayne Marina and the Dungeness Lighthouse off in the distance. Relax and recharge in this cozy, newly remodeled cabin tucked into the hillside. Boasting a large custom wraparound deck overlooking the water, you will love soaking in the Hot Tub with a glass of wine, while enjoying the sunsets over the Bay. Grill up some steaks and dine outside in front of the fire while you watch the stars come out one by one. The view is stunning any time of day, but especially breathtaking sunrise or sunset when hues of pinks and purples alight Hurricane Ridge and the horizon. Go on an adventure and take the well maintained trail that leads through the woods (300 feet) to the beach below for walking, beach combing, kayaking, rock skipping and enjoying the sun. Back at the cabin, you can whip up quick meals in the fully equipped kitchen and enjoy movies by the fire in the front living room, all while still being able to enjoy the views. Retire in one of the two tastefully decorated bedrooms; one with a king bed and the other with a double/twin bunk bed. Washer and Dryer available as well as a full bath with walk in shower. 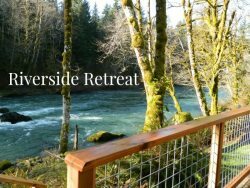 The perfect getaway for romantics needing time alone, two couples reconnecting or families looking for a great Northwest experience. Easy access to Hwy 101, downtown Sequim is just a short drive away. Discover the local Lavender Farms that dot the countryside, take a hike out to the Dungeness Spit and see lots of birds and marine life in their natural protected habitat, or feed the bears at the famous Olympic Game Farm. Downtown Sequim offers quaint shops, coffeehouses and restaurants. Looking to travel a bit further? Day trips to the Olympic National Park and west end beaches or the Victorian seaport of Port Townsend are also great ways to discover the Peninsula. Check in time is 4 PM; Check out is by 11 AM. 2nd bedroom with Bunk bed; Double bed on bottom, Twin bed on top. Beach access via trail from home. Better than any hotel I've ever paid for, View, hot tub, fire pit, cleanliness were favorite features. The house is perfectly located to explore all the are has to offer. Our time spent at the house was relaxing and restful, with the firepit and hot tub complimenting the outstanding view. They were completely helpful and proactive at every turn. They made us feel very welcomed. I really appreciated dealing with company that backed up their website with real people you can talk to and who are interested in knowing me and helping me. Sequim Bay Hideaway is a great place to stay. It was much nicer and more picturesque than the website pictures and descriptions indicate, - but there is no way capture the view, fresh air and peaceful setting on camera. The view was amazing. The kitchen/dining/living area was perfect for family time. The lush vegetation made you feel like you were completely isolated. The walk to the beach was very nice. The rental office staff and owners made us feel very, very welcomed. If we ever get a chance to come back, we sure hope to stay here again. Lovely spot, clean, great for entertaining -- especially outdoor entertaining. Comfy. Wonderful. Helpful, efficient and responsive staff. Well managed. We loved everything. Our only issue was with a late arrival, in the dark, when we were confused about which lock box to use. I mentioned this to staff at check out. The place was very clean and well thought out. I loved the view and the Hot Tub. The cabin was relaxing and private. Outstanding view, great deck! The view from this property is amazing! The outdoor grill, hot tub, heat lamp, and fire pit all worked great. We enjoyed hanging out on the beautiful deck and relaxing after a home-cooked meal. The kitchen was nicely equipped. Beds were comfortable and place was clean and well decorated. Property and location are second to none! We've stayed in a number of vacation properties. This is by far the best in terms of your home and its location. Thanks for sharing. Perfectly appointed, comfortable house on the bay. The owners have thought of everything you could need to make your stay enjoyable, comfortable and relaxing. We will be back. We spent the last week at this cabin and it exceeded our expectations. The owners were very friendly and helpful when we needed them and you can tell they put a lot of love and care into the place. We appreciated the fully stocked kitchen and the Weber grill. The view off the front deck is spectacular. We spent most of our days exploring the area but the last day we spent the entire day at the cabin. It was so relaxing and peaceful that we wish our stay had been extended a few days. A few things to note: the trail to the beach is well marked and kept. If you have little ones or unsteady on your feet it is a bit of hike (especially back up the hill). Our four year old did just fine but if you have kids 3 and under it would be a trek. You do want to bring shampoo/conditioner and body wash if you are picky. The beds were all great and we slept fantastic. This is a fantastic home! We stayed 7 nights in June (2016) and loved every single day. It offers all the amenities needed plus some. We thoroughly enjoyed our stay and hope to return in the future! When we were not at the home, my family ventured to hiking trails within the Olympic mountains. We were typically gone the entire day and looked forward to spending our nights relaxing in the hot tub listening to Blues, making dinner, and enjoying the beautiful sunsets. We would use the beach trail to make our way down to the bay and were lucky enough to find sand dollars in perfect condition. Our 7 year old loved it! This is a family-friendly home, but would also be great for a romantic getaway. It's fairly secluded but there's access to a gas station not too far away that has groceries. We found this very helpful, especially with children. We were pleasantly surprised the views were even better in-person than what the pictures show on the website. Thank you for the stay!